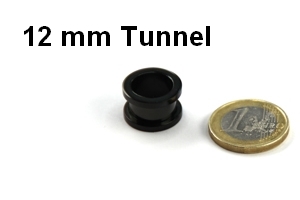 Flesh tunnels are available in diverse variations. But not every kind of flesh tunnel looks in the same way beautiful in different sizes. For example the jewelled 12mm flesh tunnels with crystals on the edge does obviously look better in 12 millimeters than it does in the size of 8mm. The reason for this is that at the 12mm tunnels there is more space available to place the rhinestones in a way that looks just perfect. If you have a smaller tunnel size the crystals need to be put closer together on the edge. This often doesn`t look in the same way beautiful as the 12mm jewelled flesh tunnels. A colourful 12mm flesh plug thus is more beautiful in 12mm than if you buy it in 5mm. Also an important aspect is the material of your 12mm tunnels. You can choose between a large range of materials also in 12mm. Of course we also have 12mm glass plugs for example. But probably you should think of selecting a lighter material like wood, horn or silicone or plastic if you buy 12mm flesh plugs because the glass plugs can be quiete heavy which is not everybody´s cup of tea. But nevertheless you can also buy glass plugs up to a size of 20mm here on flesh-tunnel-shop.com .